One of the best things we got to do during this field week was to prospect for bone on land owned by one of the local ranch families. We rely so much on the good graces of the people who surround us, and they are, without fail, incredibly warm and generous. This family went out of their way, taking an entire day to show us where previous finds had been made, and allowed us to look around on our own. Distant view of some of the land we prospected. 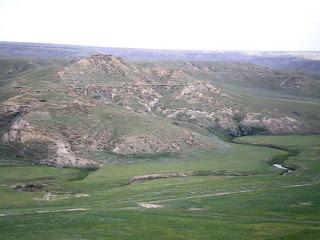 Look how green the valley lands, in this dry, high prairie! These bluffs are amazingly productive for dinosaur bone. It is an incredibly beautiful stretch of land, like a green oasis in the desert. And it is incredibly rich with dinosaur bone, all of which is extremely well preserved. 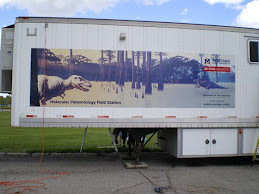 In the company of our hosts, we saw a lot of dinosaur bone, still in the ground, that hinted at the possibility of more bone to come. Jack (Horner) has a minimum criterion of 3 or more bones, in association, of a single animal, before it is deemed a ‘quarry-able’ site. Many that we visited fit this category. Need a hand to look closely at this bone—the cliff face is steep and slippery. This one required a hand up from my grad student Tim (handily cropped out of this image to save him embarrassment), but the bone embedded in the hill also looks like it might belong to a theropod, big for this time period, and, if it is a meat eater, probably Albertosaurus. Its dense outer bone and hollow core look more like a theropod than anything else. 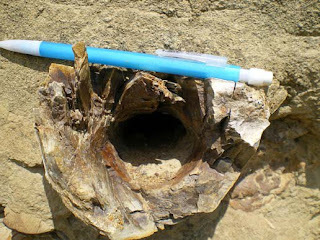 The bone is hollow, with a very dense outer layer—this might mean it is a meat eater,on the line of dinosaurs related to birds. But, the cliff face is steep and slippery, and some of the sand is highly cemented, so quarrying would be difficult. In another area, it looks even more promising, with two bones that I think might be the blade of the ilium, one of the bones making up the hip, and the other possibly the femur of another large dinosaur. The bones are protected by a large, overhanging ledge, again making quarrying a bit risky, but this is pretty exciting, I think. 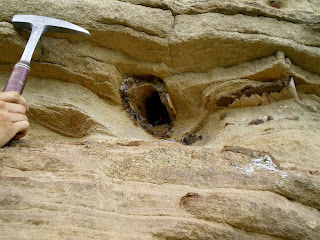 Under a sandstone overhang are hidden the remains of a dinosaur that may even be articulated! It would take some digging to know for sure. Megan, Liz, Tim and me. Is this a great job or what?